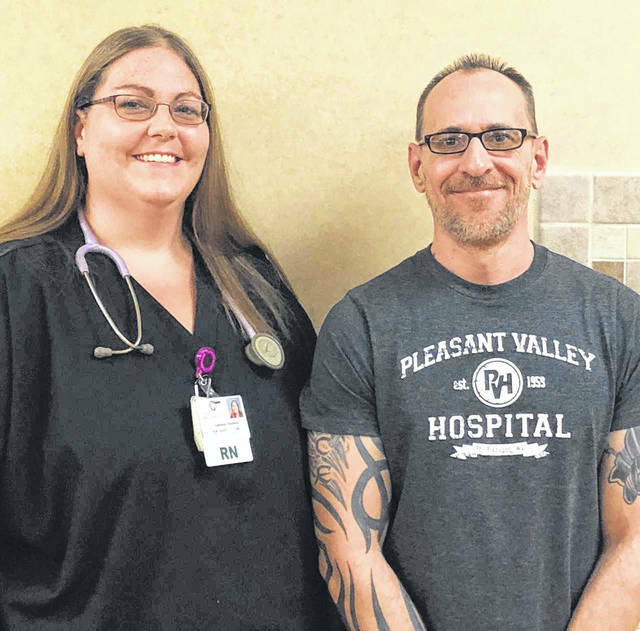 Pleasant Valley Hospital Employee of the Month Chris Gardner is pictured with Charge Nurse Cassie Haines, RN. POINT PLEASANT — Pleasant Valley Hospital (PVH) has announced the Customer Service Employee of the Month for July 2018 is Chris Gardner at PVH’s Nursing and Rehabilitation Center. He has been employed since July 2009 as a Certified Nursing Assistant. Gardner was nominated by a resident’s family. The family member requested that he be recognized for his superior work ethic. They stated he is always nice and polite, he does things for the residents without being asked, and he is always on top of everything. They stated it is always difficult to leave loved ones in a nursing facility to be cared for by others, but it is much easier when you have an employee like Chris taking care of them. “Chris is an excellent example of the PVH Employee of the Month, and we are very grateful to have him on our team,” stated a press release from PVH. In this recognition, he received a $100 check and a VIP parking space. He will also be eligible for the Customer Service Employee of the Year award with a chance for $500.